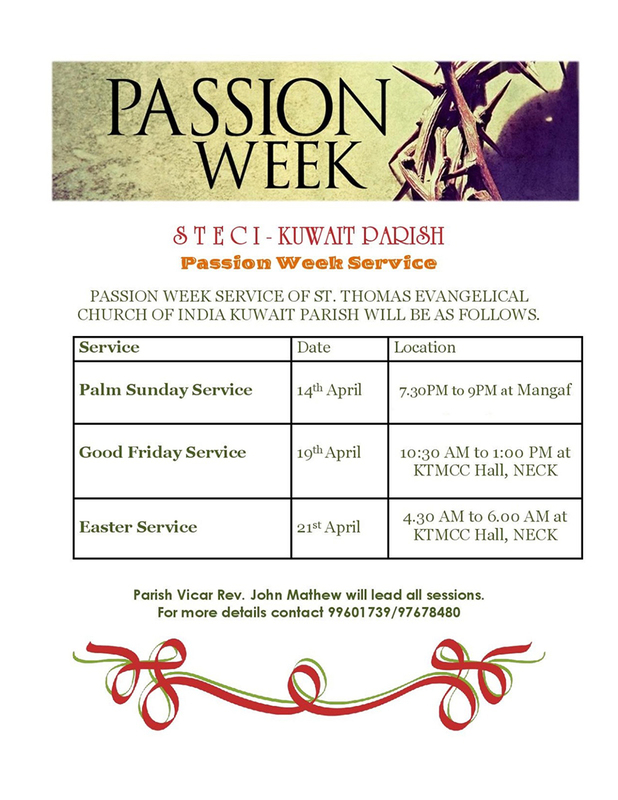 Passion Week Service of St. Thomas Evangelical Church of India Kuwait Parish will be as follows. On 14th April Palm Sunday Service is from 7.30PM to 9PM at Mangaf. 19th April Good Friday Service from 10.30 AM to 1.00 PM at KTMCC Hall and Easter Service on 21st April Sunday 4.30AM to 6.00 AM at KTMCC Hall. Good Friday message will be delivered by Rev. Johnson Alexander, Vicar of St. Peters CSI church. Parish vicar Rev. John Mathew will lead all sessions. During this week the members are requested to avoid one-time meal daily and use that amount to feed those who are in hunger and need.